The Sudbury Ephemera Archive has many examples of adverts and some are on paper bags. Shops placed all sold goods in a paper bag with their own name on it and if the article had to be returned or exchanged the trader’s bag was proof it was bought from that store. 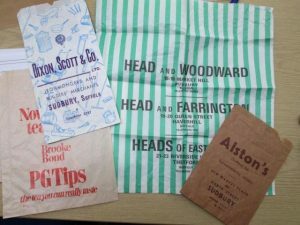 The graphics on these bags are interesting and give an insight into one method of getting a trade name known in the community; the bags for Alston’s, Dixon and Scott, Head and Woodhead are such examples. Adverts can be found in the local paper or other publications distributed around the town, such as the transport timetable books described in our article Timetables and Public Transport in November 2017. These insert adverts (which often helped to sponsor a publication and keep the price low for the man in the street) are also examples of the sort of graphics used to appeal to the local people. Another type of advert is the one displayed on a public noticeboard – some were very elaborate but in the days when adverts like these were exposed to the elements they seem to have been kept simple and informative. The Corn Exchange advert is such an example. The striking colours we are used to today are something which became more common after the Second World War. Printing and publicity processes have evolved rapidly, particularly during the last century, from the independent printing press company to the widespread adoption of home computing, which has given an opportunity to the private person to produce adverts of their own. The latter has also given us the World Wide Web and Social Media as a means of advertising and of course this does not leave the paper trail* we have seen in the past. There is also the impact of the commercial channels on TV and radio where using oral and musical accompaniment to the advert the audio and visual senses are targeted and again there is no paper evidence for the archive . The adverts give us the names of the business families in the town and also where their establishments could be found, as the address is included in the advert. Using this information one could plot the distribution of the commercial enterprises in Sudbury. 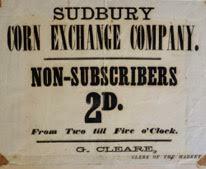 If you are interested in doing this, why not visit the Sudbury Ephemera Archive to see more of our collection of advertising materials – you can contact us via the link at the bottom of the page. (*There are electronic initiatives aimed at capturing this information for posterity, such as the UK Web Archive which ‘contains websites that publish research, that reflect the diversity of lives, interests and activities throughout the UK, and demonstrate web innovation.’ Also note that ‘since April 2013 the British Library has begun to archive the whole of the UK web domain.’ See UK Web Archive for more details).